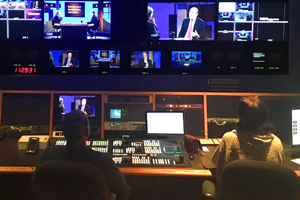 Tom Barkin appeared on public television in the Carolinas to discuss what he’s learned about the region since becoming president of the Richmond Fed this year, and about what he brings to the role from his background in business. The interview was recorded at WTVI in Charlotte, North Carolina. Barkin was interviewed by Chris William on Carolina Business Review, a program broadcast on public television stations across North Carolina and South Carolina, states where Barkin said he’d spent a good amount of time in his early months on the job. Among the things he’s heard is how companies look at issues such as hiring and investment, and about differences in the economies of rural and urban areas, all of which helps his thinking as he considers policy questions. Barkin said that in making policy decisions, he tries to bring to the task an understanding of businesses and how they work, based on a 30-year career in management consulting.